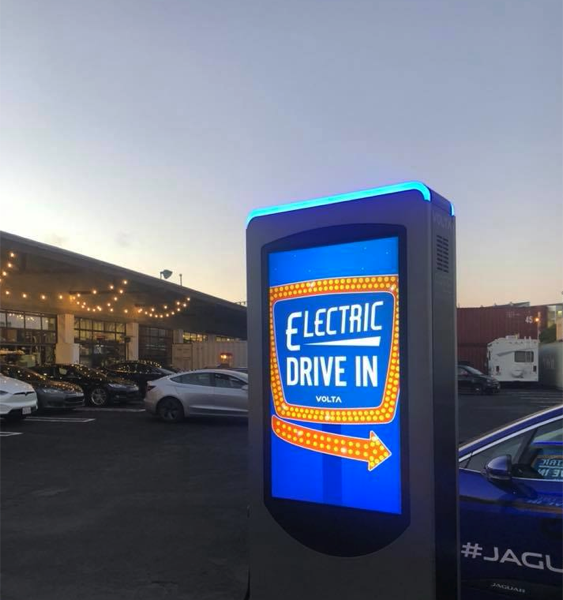 Volta invited clients, friends, and "fans" from the general public to join us in celebrating National Drive Electric Week at Volta's first All Electric Drive-In Movie Night. Our team came together to convert our entire headquarters back lot into a true drive-in movie for the night. The event featured a Bond movie projected on a 40-foot wide screen, "Bond" themed cocktails, and the "Licensed to Grill" food truck. Volta staff picked up clients in electric vehicles and provided those vehicles as their seats for the evening, giving many of them their first up close and personal experience with EVs in a fun, glamorous setting. They were thrilled with their sleek, silent electric rides and we hope that everyone who came had a wonderful Drive Electric Week. Truly a movement worth celebrating! Volta Charging converted their San Francisco headquarters into an EV-only drive-in movie theater for NDEW18. This event is SOLD OUT! There are no spaces available as of August 28, 2018. Unfortunately, registrations after that date are not valid. Thank you so much to the 70+ people who signed up to attend through various channels. Due to the popularity of this event, we may host additional drive-ins. Sign up here to get notified about future all electric drive-in movie events at Volta. #DriveForward and Happy Drive Electric Week! Celebrate National Drive Electric Week at Volta's first All Electric Drive-In Movie Night! Join us for food, fun, and popcorn on Thursday, September 13. Registered attendees report 355,861 electric miles driven.